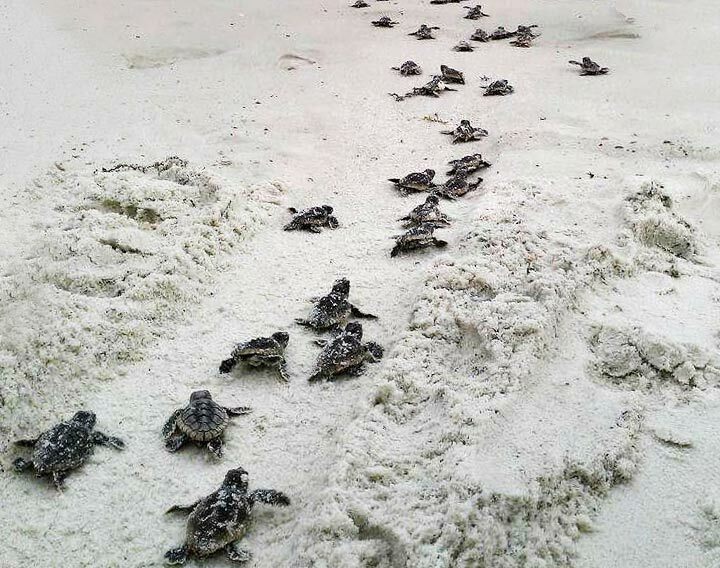 Sea turtle hatchling season is now in full swing on Pensacola Beach, so what better time to remind all residents and visitors to the island how to be good sea turtle stewards, with as little interference as possible. 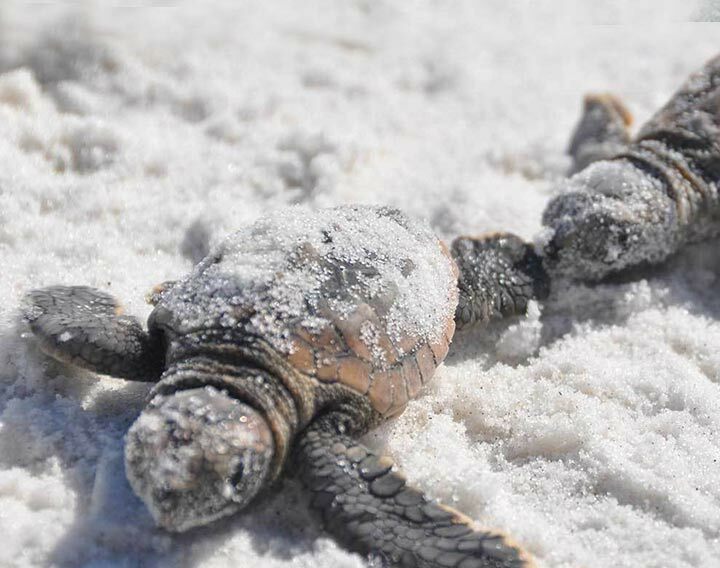 Every spring beginning in May, Loggerhead, Green, Kemp’s Ridley, and, on rare occasions, Leatherback sea turtles, choose Pensacola Beach for nesting, and about 55 to 60 days later, the babies are ready to hatch. 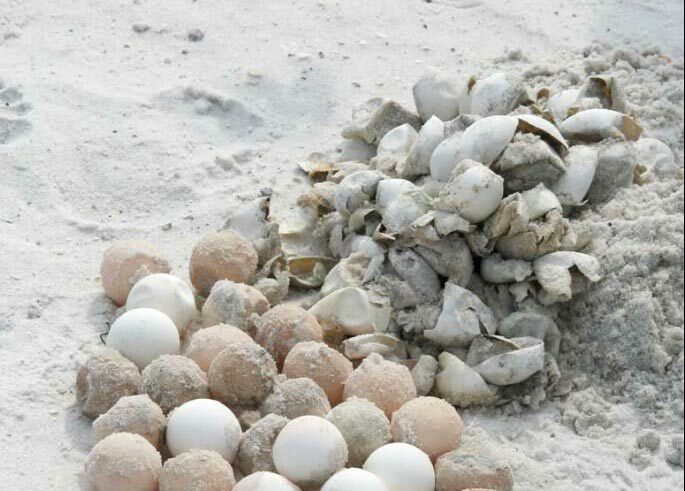 Hatchling season runs through the end of October on Pensacola Beach, with the height of hatching in August and September. 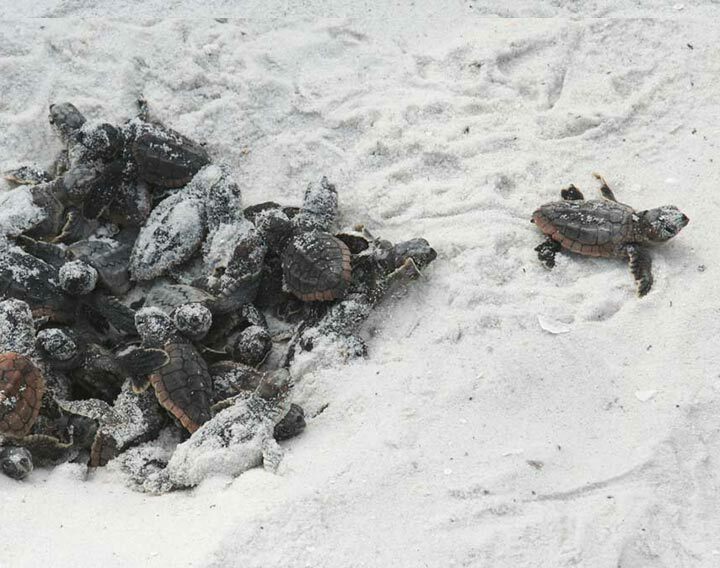 Did you know that only about 1 in 1,000 hatchlings will survive to adulthood? That’s why it’s so important to always be respectful and considerate of nesting sea turtles and hatchlings to ensure that future generations get to enjoy them too. Nearly all species of sea turtle are classified as endangered, and some, like the Kemp’s Ridley, are critically endangered. 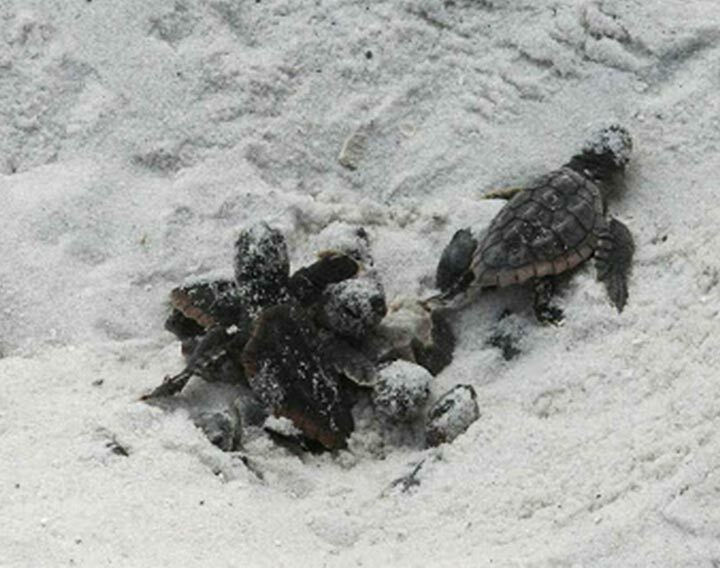 Baby sea turtles face many obstacles when first leaving their nests — such as raccoons, crabs, birds and fish. Sea turtle hatchlings also use the light of the moon to guide themselves to the water, but can get distracted by bright lights from beach homes, condos and businesses facing the beach. Fun fact: Most of the turtles that hatch along Pensacola Beach tend to be males. Why, you may ask? The gender of all sea turtle hatchlings depends on the temperature of the sand during the 45-to-60 day incubation period. The warmer the sand, the more females the nest will produce. 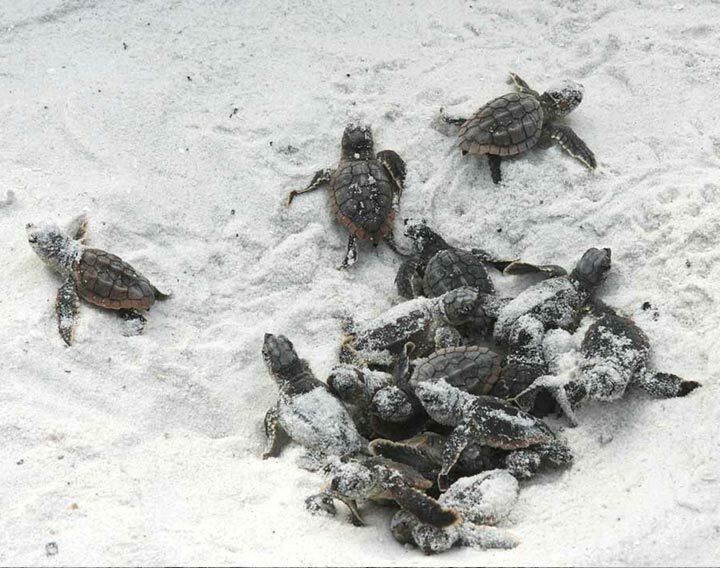 Northwest Florida beaches produce mostly male turtles. Only the female sea turtles come back ashore to nest. It can take decades for them to reach reproductive maturity, but once they do, they usually return to the same area where they were born to lay their eggs. So it’s a big deal when researchers and park rangers find turtle nests along Pensacola Beach, since we don’t produce many females. And it’s why we must do everything in our power to protect the nests and ensure the baby sea turtles inside them have the best chance to survive. CLEAN– Remove all tents, canopies, furniture, toys and other obstacles from the beach every night. Leave only your footprints behind. FLAT– Fill in large holes, knock down sandcastles and other obstacles to leave the beach flat for nesting sea turtles and hatchlings making their way to the water. DARK – When walking the beach at night during turtle season, remember to use a red flashlight. Sea turtles and hatchlings are less likely to be attracted and disoriented by red lighting. Never touch or harass a nesting sea turtle or baby hatchlings as they leave their nest. Watch quietly from a distance and never shine lights or use flash photography, which could disorient them. 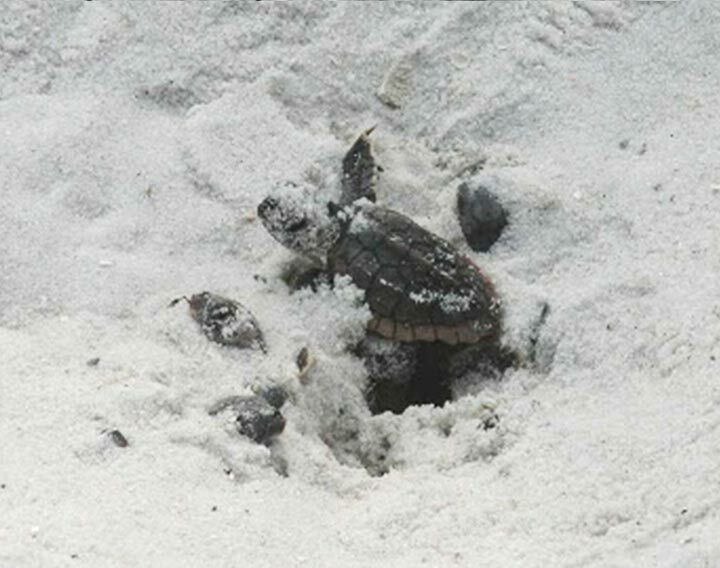 If you see a sea turtle or hatchling that is sick, injured, in distress or deceased, please call the Florida Fish and Wildlife Conservation Commission 24-hour hotline at 888-404-3922. These simple measures will help this endangered species succeed, so we can continue to enjoy seeing them swim in our waters and crawl onto our shore for generations to come. TripAdvisor Names Pensacola Beach One of the Top Five Beaches in the U.S. Welcome to Spring Break 2019 on Pensacola Beach! Was there ever really a casino on Pensacola Beach?